It’s finally here! The bracket was released last night during the Selection Show, and we now know the arrangement of the 68 teams that will be competing for the Division I men’s basketball national championship! If you’re a complete basketball novice trying to win your office pool, or just looking to supplement your intuition with some data, you’re in exactly the right place. First going region by region and then moving on to the Final Four, I’ll walk you through which teams are the favorites, throw in a few percentage charts so you can get the full picture of what’s likely to happen, give you the rundown on all the most likely first-round upsets (11-seeds and below beating 6-seeds and above), and finally, compare all that to which teams are being picked by others so you can give yourself the biggest chance to rise above the pack. Along the way, I’ll mention a team’s BracketBot ranking from time to time – this is different from the ranking you might have seen in my power rankings or across the web site. It represents a purely forward-looking ranking, so my estimates of who would win in a neutral court situation, like the NCAA tournament for example. Let’s get started! This may seem like a no-duh kind of statement – you fill out a bracket by picking who you think will win each game, right? Well, sure, I bet most of you do it that way, but I’m going to dish out my first piece of advice right here – work backwards! The Final Four and championship games are worth far more than any other games if you’re trying to win a bracket contest, so start there. Find the teams that you think will make the Final Four and pencil them in first. Why? Well, picking upsets is really tempting! While there are matchup differences in college basketball – some teams having a particular style that suits particular opponents – they’re relatively rare. So if you think a team is good enough to go to the Final Four, pick them and figure out the earlier rounds later. This is probably more true this year than usual, because the top 8 teams were pretty far ahead of the rest of the pack! 16 vs. 1: Nah, not this time. Last year, when I wrote a similar post to this elsewhere, I said, “if you want to pick one and go for the home run, check out the 1 vs. 16 game in the Midwest bracket – Kansas vs. Penn”. Nobody saw the massive Virginia vs. UMBC upset coming last time, and no one would see it coming if it happened again this year. Part of the reason for that is that the 1-seeds look especially strong this time, and the 16-seeds are nothing special. All four 1-seeds rate as having less than a 1.4% chance of losing their first game, quite a bit lower than last year (Penn vs. Kansas in 2018, which I still advised against, was about a 6% chance, and the others were all around 2%). Don’t get cute here – even if one happens, you probably won’t pick the right one. 15 vs. 2: This is where it starts to enter the realm of reasonability, but still, the 2-seeds are particularly strong this year. None of these upsets has more than a 5% chance of happening, so again, don’t get cute here. 14 vs. 3 and 13 vs. 4: Now we’re talkin’. While the 1 and 2 seeds are especially strong in this year’s tournament, the 3 and 4 seeds really aren’t. The probability of all eight of these 3 and 4 seeds winning is only about 38%, and on average, 1 of them loses per simulation. The problem there is that it’s hard to figure out which one will happen – the most likely upset being 13-seed UC-Irvine over 4-seed Kansas State in the South Region at just 17%. I’ll give you all the numbers later on so you can make a decision for yourself – the safest decision might just be picking all of these top seeds to move on, but we’re into “pick your spots” territory. 12 vs. 5: The classic – this is where so many upsets happen that no one even gets surprised by them anymore. A lot of “brackets for beginners” type of folks will tell you to pick a 12-over-5 no matter what, but remember that you don’t have to. All four 5 seeds have a better than 2/3 chance of winning in the first round, so the most likely individual outcome is that all four of them win. Again, we’re playing by feel here. I’ll go over all of these individually down in the region sections, but the most likely 12 winner is Oregon over Wisconsin (33%) and Liberty over Mississippi State or New Mexico State over Auburn are both about equally unlikely (17% and 18% respectively). The biggest reason that it might be good for your chances to avoid picking a 12 over a 5 is precisely because most people will be picking one, but if you find one or two of these that you like, go for it. 6, 7, 8, 9, 10, 11: At this point, the teams are pretty close to one another in quality. If you don’t know anything about any of these teams, it’s almost time to start throwing darts at the wall here. Only a few of these teams are real pronounced favorites in their first-round games, so pick who you want in these. I’ll give you the probabilities below, but these are really all up to you. Duke, the deserved #1 overall seed in the tournament, has the second-highest chance of winning their region of any team behind only Virginia in the South bracket. One of the main reasons they don’t rank higher than UVA is the team on the opposite side of the region from them, Michigan State. It was really interesting to see the Spartans picked as not only a 2 seed, but a 2 seed having to face Duke – I and many others predicted incorrectly that Michigan State would be a 1 seed, so to wind up with such a tough opponent despite (presumably) just missing out on that prize is a tough break. 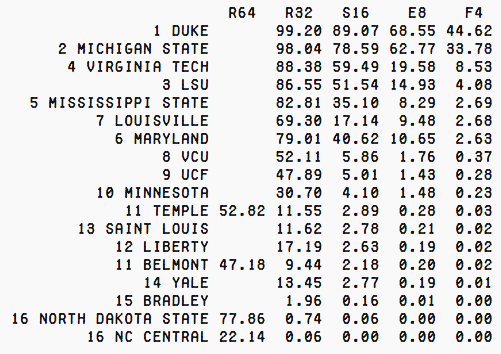 In the BracketBot predictive rankings, Duke and MSU rank #2 and #3 overall, so they’re both very much Final Four quality. It’s unfortunate that one of them will be gone by then. 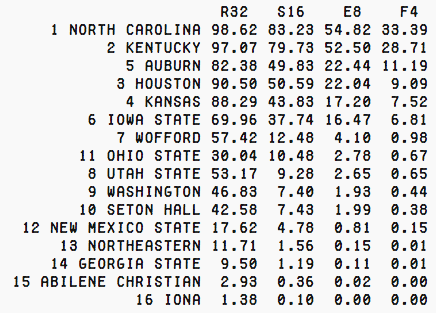 The teams below the top 2 in this region are an interesting motley crew. The best, no doubt, is 4th-seeded Virginia Tech, who are rated 11th overall by BracketBot, and that doesn’t even account for the fact that their star player Justin Robinson will return from injury for the tournament. They look like the strongest 4-seed in the entire bracket, with not-insignificant odds of getting past Duke in the Sweet Sixteen. Let’s look at how the people are predicting this region to go! This data comes from ESPN’s Tournament Challenge and all brackets submitted to this point (not sponsored or anything, it’s just a nice bit of public-facing data). I was surprised to see the huge number of people that are predicting Duke to win this region. While it’s always probably a good idea to pick the team most likely to win, I don’t see Duke as this heavy of a favorite. If you’re looking to get ahead, they might be a team to skip over just to play the odds. You’ll lose out if Duke does actually make the Final Four, which is still the most likely outcome, but you stand a chance of looking really smart if they don’t. Michigan State, on the other hand, looks like an excellent pick here. Their odds of winning this region are more than double the percentage of people that are predicting them to. If you don’t want either of those two, then Virginia Tech is a good choice also, but then remember that you’re playing a riskier game. They have a decent chance of not even making it to the matchup with Duke. Liberty has been a very popular upset pick in the 12-5 matchup, but I think the public is overinflating their chances a little bit. I actually think they’re the 12-seed that is least likely to win in the first round – 17% is fairly low. None of the upsets in this region is particularly likely, but if you feel like you need one, look for the winner of the Belmont/Temple game to give Maryland a tough time in the 6-11 matchup. It always seems like the teams that win play-in games perform better than expected in the round of 64, possibly because the higher seed they’re facing has had less time to game-plan for a specific opponent. 21% might be underselling it slightly for that reason, although I also wouldn’t bet the farm on it. All four of these upsets are being a bit overpredicted by the public, which is normal, but Liberty is the only one I’d specifically advise against. A lot more people will be picking Liberty than should, so you can get a leg up if Mississippi State survives the first round. 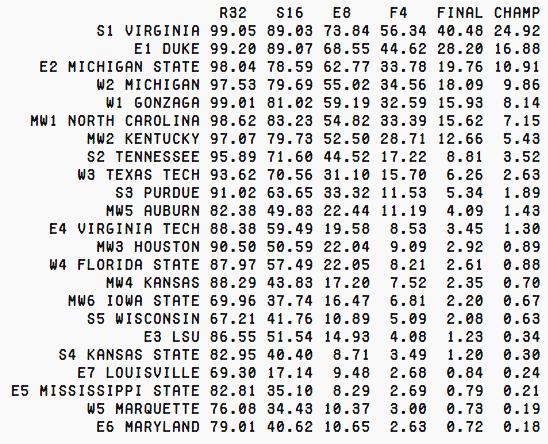 Virginia has the highest probability of any team to make it to the Final Four, and in fact BracketBot rates them as the best team overall and most likely to win the championship as well. People may very well be scared off of Virginia because of last year’s disaster (losing in the first round to 16th-seeded UMBC after being chosen as the #1 overall team), which may open the door for you to swoop in and be on the bandwagon for the inevitable longer run this time ’round. 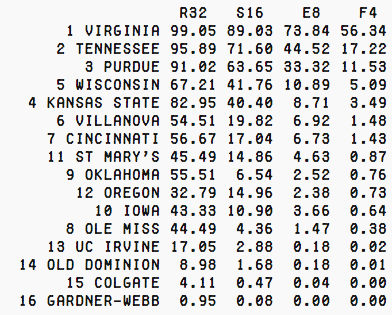 Tennessee also rates as the worst of the 2 seeds (although by small margins, and they’re all excellent), another slight boost for the Hoos. It’s worth noting that this region is chock full of teams that all play a similar slow-tempo style – Virginia is the team most known for it (and does it to the most extreme level), but Wisconsin and Cincinnati have been famous for it in recent years, and Kansas State, Villanova, St Mary’s, Oregon and Old Dominion were all among the slowest-playing 10% of teams in the country this year. (What I mean by that is, these are all teams that take their time and use up as much of the shot clock as possible, whether by playing more passively on offense, more staunchly on defense, or both.) I think that plays right into Virginia’s hands – if and when they reach the Sweet Sixteen rounds, their next two games are likely to be against a style that they have completely perfected. Even if that weren’t the case, Virginia is good enough to make me completely forget about last year. The storylines in this round aren’t nearly as juicy as they are with LSU in the East Region, but there is an interesting wrinkle in that this region features last year’s national champions, Villanova, as its 6 seed. You can tell by the seeding there that this was a down year for Nova (who also won the 2016 championship), and that number doesn’t lie. I have Villanova rated lowest out of the 6-seeds, and their first-round opponent, St Mary’s, is the best 11-seed by a decent margin. As such, Villanova is the only 6-seed in this bracket that isn’t a significant favorite in the first round. The populace at large is betting on Villanova much more than the other 6 seeds (on par with the 3-seeds), probably because it’s a name they recognize. Don’t get sucked into that brand name – I don’t expect Nova to do too much this time around. A lot of love for Tennessee here, and although I think there’s a very significant chance they make it through the first three rounds, I don’t like their chances nearly as much as the ESPN viewing public does. And, as mentioned above, Villanova has gotten serious inflation from their name recognition. The best bet here looks like the simplest one – Virginia has proven to the basketball-watching world that they’re a better team than they were last year, and I don’t think the UMBC game from now over a year ago has any bearing on what they’ll do in the next couple of weeks. If you don’t want either of the top two seeds, Purdue is not getting the amount of love that they should, and a pick for them in the Final Four would be a huge coup in your bracket competition if they were to pull it off. I don’t want to pile on Villanova any more, so I won’t. St Mary’s ranks as the top 11-seed in the bracket, even to the point where they’re rated as the eighth-best team in this region, not the 11th. I wouldn’t really even call it an upset if they win. We also have the most likely 12-over-5 and 13-over-4 upsets in this region, so it could be one where multiple double-digit seeds advance pretty far. If you’re going to eschew my advice from above and pick a 15-over-2 upset, Colgate over Tennessee is probably the one to go for as well. St Mary’s is getting seriously underplayed here, to the point where I think I’m almost willing to tell you to just pick them unabashedly. The others are more up to you as they’re pretty close, so go with your gut. Play the percentages there however you want, really. An interesting region to be sure, and definitely the one that’s easiest to sum up quickly. We’ve got 6 excellent teams here, all rated between 6th and 17th overall by this model. (I didn’t really think North Carolina was deserving of a #1 seed, but that’s neither here nor there.) North Carolina and Kentucky get a leg up in the probability of winning it for two reasons: one, they’re the best two teams of the bunch at #6 and #7 overall, respectively, and two, they wouldn’t have to play any of the four other really good teams here until the Sweet Sixteen round. Meanwhile, Auburn/Kansas and Houston/Iowa State are both pretty likely second-round matchups, so at least two of those teams will have their season end in the next six days. Carolina gets a lot of love here, and as a result the other five top teams are all having their chances understated by the people as a whole. Gotta think this is the same kind of name recognition boost that I talked about with Villanova above – UNC won the 2017 championship (and a couple of those guys are still around), and they definitely could do the same this year, but I don’t think it’s nearly as likely as the ESPN populace makes it seem. I think it’s worth eschewing Carolina in favor of one of the other five teams. Which one you go with is up to you – Kentucky looks like the safe choice, but any of the 2 through 6 seeds here may be a bet worth taking. Auburn in particular looks like they’re worth a flyer if you’re in a risk-taking mood. They just got done flattening Tennessee yesterday in the SEC championship, winning by 20, so on top of being the best 5-seed in my book, they’re also playing pretty well right now. This one’s up to you though – even North Carolina wouldn’t be a bad choice, just maybe not one that will set you apart from other people’s brackets. Unlike the South, this is not likely to be an upset-heavy region. The 6-11 matchups typically don’t qualify too much as upsets anyway, so it would be no surprise if Ohio State beat Iowa State in the first round. In a year where the 1 and 2 seeds are as strong as they are, Iona is the only 16-seed with more than a 1 percent chance of moving ahead, so if we’re going full balls-to-the-wall that’s an option too. Hey, nice job to the users of ESPN, actually doing a pretty damn good job here. I like seeing NMSU/Auburn being right on the dot with my prediction to the tenth of a percent. Usually upsets are over-represented in the people’s brackets-at-large, but not too many people are biting on these so go for them if you’re feelin’ lucky. This is the only region where the #1 seed is not the most likely winner, though it’s quite close, and it’s the region where the #1 seed has the lowest probability of advancing (just barely). It’s not even that Gonzaga is the weakest #1 seed, because they aren’t, but Michigan is the second-strongest 2-seed, Texas Tech is the strongest 3-seed and Florida State is the second-strongest 4-seed, so the competition is stiff. I personally expected Florida State to be a 3 seed after their huge win over Virginia on Friday, but it didn’t come to pass. After the top four, there’s a sizable next tier of teams with chances worth checking out, making this the region in which the most teams have 1% probability of making the Final Four or greater (eight). I can’t discount the possibility of the Sweet Sixteen round including a few of Marquette, Buffalo, Florida and Syracuse, if not all four of them. 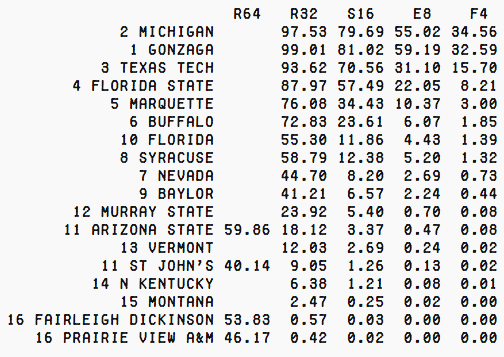 Still, either Michigan or Gonzaga is the way to go if you’re wanting something safe-ish. This is possibly the best Gonzaga team ever, in a long, long line of excellent Gonzaga teams, and they were a clear #1 seed choice before their shocking loss to St Mary’s recently, so it’s perhaps not surprising to see the degree to which they’ve been favored by the public here. The difference in the percentage I’m giving them and the percentage that are picking them probably actually lies with how good Michigan is. People are a little low on Michigan, I think, so I think they would be a solid play to make the Final Four from this spot. If you like Gonzaga, though, go with them! The advantage here is not super extreme, so pick your favorite. Florida State and Texas Tech are being picked at almost the exact same clip, no surprise given FSU’s impressive performance at the ACC tournament, but I think Texas Tech is the play if you want to go a little bit off the board with their chances, in my estimation, as almost double the proportion of people that are picking them. If you want to go really off-board, like really, really off the board, then 10th-seeded Florida is a cool long-shot. They’re the only double-digit seed with more than a 1% chance of making it to the Final Four. They also had an impressive conference tournament performance, taking down regular-season champs LSU as the 8th-place team in the SEC before going down to the wire with Auburn (and losing on a somewhat controversial play). Murray State over Marquette is the most popular 12-5 upset among ESPN users, and I don’t think it should be. This game is probably the most hyped-up first round matchup for the individual battle between Marquette’s Markus Howard and Murray State’s Ja Morant. You will probably want to watch this game no matter what, but I think Marquette will most likely come out on top. This region also has the other First Four matchups (the play-in games), with ASU receiving that fate for the second straight year. If they do get through St John’s, the matchup of Bobby Hurley against his former team, seeded higher without him, would be fascinating. (At least if you’re neutral; as a Sun Devil myself it was the very last thing I wanted.) As mentioned above, the teams that come through those games as 11 or 12 seeds always seem to do better in the following round than they’re supposed to, and I wouldn’t be at all surprised to see Buffalo go down. The people who have submitted their brackets so far, collectively, LOVE Murray State. Almost 15% of people have actually put Murray State in their Sweet Sixteen, which seems crazy to me as their actual odds of doing so are more like 5%. On the flip side, the play-in/Buffalo game seems to have slanted a little bit too far in Buffalo’s favor, so whichever power-conference team comes out of that looks like they could be a solid bet. That’s every team with a greater than 1% chance of winning it all, per this model. It shouldn’t surprise you to learn that these are BracketBot’s 12 favorite teams, almost exactly in order (VT is #11 and Auburn #12, but Virginia Tech’s road is slightly harder than Auburn’s since they’ll probably get Duke), so take that with a grain of salt if you want, but that’s how I’m seeing it. Turns out the places in which teams are seeded don’t really have that big an effect on who ends up winning it all, at least this year. Most seem to agree that the bracket was pretty well put-together this year, which is nice to hear since it’s usually so negative. Holy moly, the people love Duke. They love Carolina too, but not to the same extent – there’s enough brackets picking those two that every other team on my list bar Tennessee has its chances understated by the ESPN users at large. I don’t think you’ll get too far in your bracket pool by picking from either end of Tobacco Road, unless you’re feeling really confident in the rest of your picks. I don’t want to tell you exactly what to do, but there are a few teams that jump out at me here. Virginia is an obvious one, but Michigan and Michigan State both look like good picks. This has been such a good year for the top teams in college basketball; any of the top 8 could definitely walk away with the championship and would be totally deserving of it. Here’s one final percentage chart – I’ve included every team that, according to the BracketBot model, has at least a one in a thousand shot at winning the championship. There are 23 of them in total – apologies to Buffalo, Villanova and Cincinnati, who just miss the cut, but I had to draw the cutoff somewhere. On the other end, we’ve got NC Central with odds of 33 trillion to 1 (in case you’re curious), but I definitely wouldn’t pick any team that isn’t on this list. The usual tiebreaker: On most sites and in most offline pools, the tiebreaker is predicting the total number of points that will be scored in the championship game, usually just closest to the right answer (not Price-is-Right rules). There’s not too much to predict there since it’s pretty hard to know who will actually be there in the championship, but I’d say it’s a safe bet to just throw down a number in the 130-150 range. If there’s a particularly slow team like Virginia, Kansas State or Virginia Tech in your championship game, maybe adjust that down by 15 points or so, and if there’s a really fast team in your championship game, like North Carolina or Duke, up by 15 points or so. There’s no real science to this, just remember to pick a tiebreaker that works with the team you’ve chosen as a winner since the tiebreaker probably won’t come into play unless your champion is part of the equation. That’s it, really! I hope you got something useful out of this post, and I’m sorry if you had to read it in a hurry – really didn’t expect this to be over 4500 words long. Let me know, either here or privately, if you have any other questions or need any other particular advice and I’ll see if I can help. Have fun watching basketball over the next several weeks!